Do you have ancestry in the Gold Coast area? 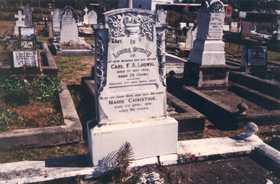 Bethania Lutheran Cemetery is located in the grounds of the Lutheran church at Church Road, Bethania in the Gold Coast City area. It is the oldest Lutheran Church in Queensland, with a plaque on the church commemorating the arrival of Lutheran pioneers in the area in 1864. A grave at the front of the church records the deaths in 1864 of three of the early pioneers, Auguste Tesch, Herman Kuter and Wm. R. Rehfeldt. This transcript of its cemetery was made in December 1995, and is a wonderful genealogy tool for anyone exploring theor family history or building a family tree.